I will never forget the first time I stepped outside my comfort zone and prepared to teach 5 minutes of a group fitness class. I had practiced my notes, rehearsed so much I knew all two moves I was going to do in my sleep, picked out the perfect royal blue shirt and put just the right amount of make-up on to look cute but not overdressed. As the days lead up to my "big day" I began to lose my appetite and the day of the class anything I did eat came right on back out. With sweaty palms, a shaky voice and eyes starring at the ground I began to teach 5 minutes of an hour class. The result? I failed miserably. But the craziest part was that it sparked something in me to try it again. You see, you don't actually fail until you just quit trying. These days I no longer lose appetite when preparing to teach, I have confidence, I can make eye contact with my class and I rarely have a mess up. Many people have asked me how I got from point A(terrified) to point B(walking in confidence in my calling). 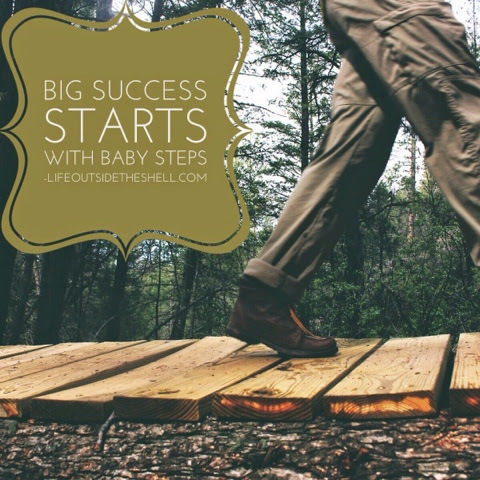 Here are some baby steps I have taken over the years that have resulted in huge changes in my confidence and my ability to stick my head out of my shell and try new things. 1. Know who we are in the Lord. I have learned that when we try new things and take risks if we do it in our own power we will fail miserably. If I don't know that I am first and foremost a daughter of the most high God than I will always be too self-conscious to move forward. I know that even if I fail miserably at something that my relationship with God is unwavering and that brings such peace that only He can bring. I am a big fan of stepping outside of our comfort zone but not before we first consult with God. 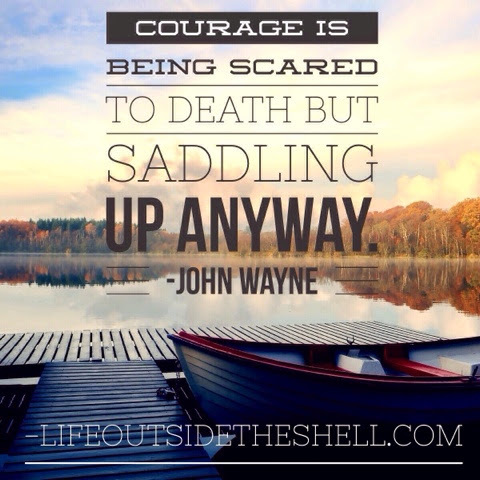 You can read my thoughts on using our shell as our place of refuge and strength here. If we all decided to just follow our friends on what "outside the shell" is than we completely miss the call God has on our lives. We must hear God for ourselves so we can remember that word when fear tries to creep in. We hear from God just like we would if we wanted to talk with a friend, by spending time with Him. Get to know Him in his written word and fellowship(or hang out) with Him through praise and prayer. 3. Look fear in the face. After we discover our true identity, hear from the Lord and have looked fear in the face we just have to do it. Here is one of my favorite quotes that I had on my bathroom mirror for years. Last, but certainly not least, speak the word of God before, during and after your outside the shell moment. The word of God is alive and active and sharper than any double-edged sword(Hebrews 4:12). Find a scripture on fear that really speaks to you(there are 365 in the Bible...one for every day of the year!) and know it inside and out. My scripture, the one which this blog was founded on, is 2 Timothy 1:7 "For God has not given us a spirit of fear or timidity, but power, love and self-discipline". I love speaking that one out loud and aligning my thoughts and words with Gods. We have the power of life and death in our tongue and we must choose life. I would love to hear what your favorite verse is and how you use it to overcome obstacles! Remember, every journey starts with one step...take a step of faith today!